Register with the web-link and get the address. Location is in Folsom, CA. 8 machines set up for the main tournament. Open qualification will be from 10AM to 4PM. Playoffs will follow afterwards, with a 30 minutes break prior. Players are ranked by their score on each machine. Any player that has at least 1 point at the end of the qualification period is in the playoffs. That means that up to 32 people can make the playoffs! Playoff seeding will be based on the number of points accumulated by each player, with the highest total being given the higher seed. Players seeded 1-8 will be given 2 byes. Players seeded 9-16 will be given 1 bye. Players seeded 17-32 will meet in the first round. Playoffs will be best of 3 match play on any of the main tournament machines (no repeat in a round within the same match), without reseeding, until a winner emerges. $1 per entry will give one try on one machine. Players can enter and make the playoffs on only one try! One entry for $1, must complete the progressively more difficult goals on each machine to advance. Fail at any level and this will be your score. To improve your score, you’ll need to get a new entry and try again. $1, as many entries as you want to/can play. 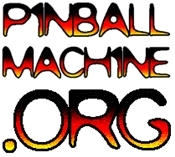 ← Follow Bay Area Players at the Pinball World Championship Live!